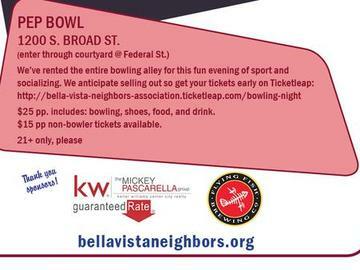 Join Bella Vista Neighbors Association for a Friday night bowling fundraiser at PEP Bowl! Bowling tickets are good for one bowling game, shoe rental, and tickets for complimentary food, beer, wine, and soft drinks. A limited number of bowling slots are available, but non-bowlers are still welcome to come enjoy some complimentary food, drink, and conversation with neighbors. Proceeds from the fundraiser will help sustain BVNA's busy calendar of neighborhood events and initiatives throughout the year. Many thanks to the Mickey Pascarella Group at Keller Williams and Guaranteed Rate for their generous sponsorship of complimentary food and drinks, and to Councilman Mark Squilla for making this event possible with a Philadelphia Activities Fund grant.